From the redwood forest, to the gulf stream waters, this land was made for you and me… And the best, cheapest way to see this great nation of ours is to go car camping. We’ve picked out the best car camping spots near and far. You can pitch a tent in America’s most beautiful beaches, mountains and forests for less than the cost of breakfast at Denny’s. Here are five of the best car camping destinations in the U.S.
We’ll move from east to west, so grab a hold of your Guide to Car Camping 101 and get ready to hit the road. 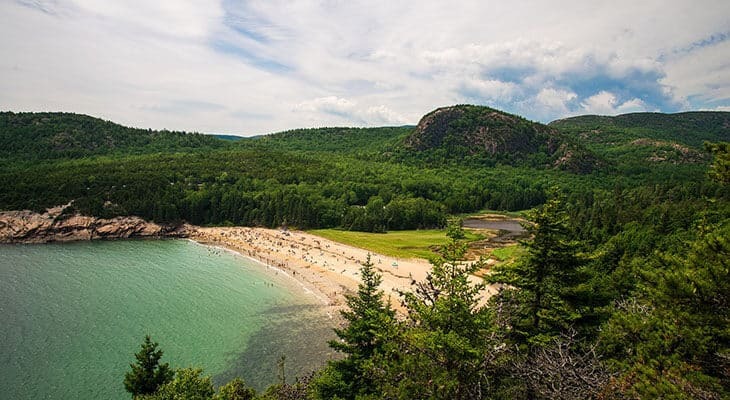 Acadia was the very first national park designated on the east coast, and today remains an immensely popular summer destination. Located on Maine’s Mount Desert Island, the park is a wonderland of pine forests, rocky cliffs, and shoreline. If you’re an early bird, drive or hike up Cadillac Mountain before dawn to see the sun rise. The free Island Explorer shuttle buses can carry you to hiking trails, beaches and nearby shops and restaurants. There are three campgrounds: central Blackwoods, rustic Seawall and the new Schoodic Woods. Reservations are a good idea, because the campgrounds are generally full or near capacity from mid-June through mid-October. 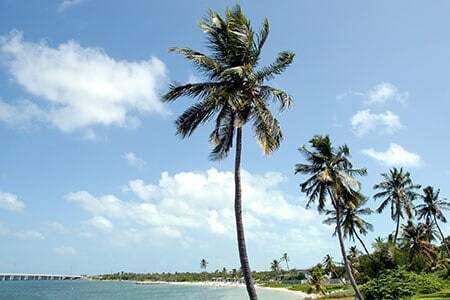 It’s surprisingly hard to find a good place to car camp in the Florida Keys, which makes Bahia Honda State Park even more of a treasure. This park at mile marker 37 boasts palm-lined beaches, tarpon fishing, swimming and kayaking. Don’t miss a snorkeling tour of Looe Key National Marine Sanctuary, where you can see corals, angelfish, barracuda and rays. All campsites are not equal in this popular park. The very best car camping sites are 64-72 in the Sandspur Campground. FloridaRambler declares: “The other Sandspur tent sites are stuffed into mosquito-infested underbrush with limited beach access.” A few sites in the nearby Bayside Campground are good choices too. To get the site you want, you’ll have to reserve it online 11 ½ months (yes, months) before your trip. 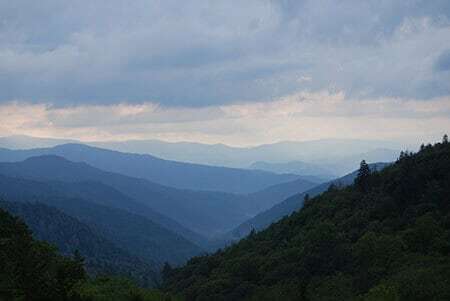 Even though Great Smoky Mountains is the most heavily visited national park in the United States, it’s still a place where you can be awed by natural beauty. Climb the Chimney Tops trail for See elk grazing in the Cataloochee Valley. If you’re lucky, you can see the park’s famous synchronous fireflies in late May-early June, which flash their lights in unison. Of the 10 campgrounds available, Cades Cove, Elkmont, and Smokemont are the most heavily used. Cades Cove offers several creature comforts, including a general store that rents bicycles and serves ice cream. For peace and quiet, head to Abrams Creek, which has campsites right on the river, or Deep Creek, which has three lovely waterfalls in walking distance. “This looks like the very edge of the world,” Lady Bird Johnson once said of Big Bend National Park. 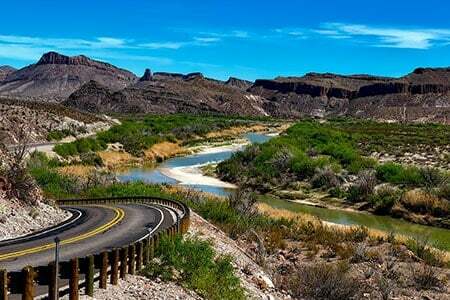 This desert haven in southwestern Texas, along the Mexico border, is known for its stunning scenery. There are more than 800,000 acres of mountains, canyons, desert and river in Big Bend National Park. It’s not all wilderness either. Within the park, you can visit the Castolon Compound, a former cavalry camp that dates to 1920, and the ruins of the Sam Nail Ranch. “Here, you’ll see an original windmill that still pumps out water and is a magnet for some of the park’s thirsty wildlife, including javelinas, painted buntings, green-tailed towhees, and mockingbirds,” Budget Travel says. There are three campgrounds in the park: Chisos Basin, Rio Grande Village and Cottonwood. Sites are first come, first-serve and they fill quickly. A limited number of campsites in the Rio Grande Village and the Chisos Basin campgrounds are reservable in the off season (November-April/May). Rio Grande has an added bonus: hot springs for soaking. The northernmost of California’s redwood parks, Jedediah Smith is also, many say, the most beautiful. 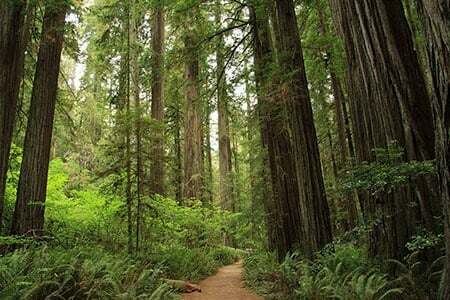 Twenty miles of trails wind through a lush and ancient forest that includes the famous 300-foot-tall Boy Scout Tree, which is actually two massive redwoods fused together. A site called the Grove of Titans is home to some of the largest redwoods on Earth. However, the increase in visitation to this once-secret place is damaging its surroundings. The park’s known for its clean and spacious campground, with modern and inviting bathrooms. “The best campsites are sites 47-58, which are near the group camp,” advises RedwoodHikes.com. They’re close to the river and surrounded by towering trees. Ready, set, camp! Make sure to protect your car with insurance, just in case a tree falls on your car while you’re experiencing the best car camping across the country. Compare.com can help by giving you free quotes from multiple insurers in minutes.